I'm so excited to finally start of this Street Food Series. I've been wanting to do this forever, and I'm glad that I've FINALLY started off. 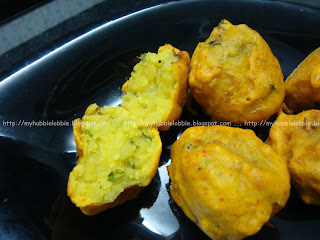 For my first pick, I decided to make Batata (Potato) Vada (Dumplings). This is a yummy snack that should be served hot preferably soon after it is fried. Those pressed for time, can make the mixes a little ahead of time and then simply deep fry the dumplings just before serving. There's something warm, hearty and comforting about these little vadas that my husband and I (along with atleast a few million people, I think) absolutely love. These dumplings can be served with some tomato sauce or the traditional sweet tamarind chutney, coriander chutney and the dry garlic chutney and deep fried salted green chillies. This time around I served it with tomato sauce but when I try out the other accompaniments, I will post about them as well. I hope you try out this simple snack and I'd love to hear what you think of it. Add a pinch of turmeric powder and salt to taste to the mashed potato and mix well. In a small pan, prepare the tempering or tadka. Heat the vegetable oil and add the mustard seeds. When it sputters, on a low to medium flame add the curry leaves, green chilly and saute a little till all the flavors are released, taking care to not burn the spices. Add the potato mix to this and stir the oil and spices have mixed with the mashed potato, for a few seconds. Take it off the pan and into a bowl. Add the chopped coriander leaves and using your hand mix it well. Check for salt and spice and adjust accordingly. Don't under salt the potato mix. Shape into balls and keep aside. In a bowl, mix the chick pea flour, with a pinch of turmeric powder, chilly powder and salt to taste. Add a little water to form a batter. Make sure there are no lumps and the batter is nice and smooth. The batter should have a pouring consistency but shouldn't be too thin. 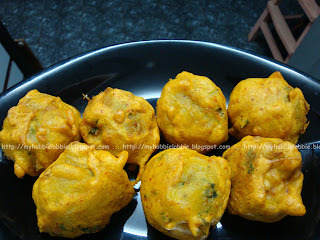 It should be thick enough to form a nice layer around the vadas. If it is too thick, add a little water to thin it out. If it is too thin and watery, simply add some more chick pea flour. Heat the oil for deep frying. The oil should be hot but not smoking. One way to tell if your oil is hot enough is to carefully insert a drop of the batter into the oil. If it bubbles and rises to the top immediately, the oil is ready. Dip the prepared balls in the batter and make sure that the batter coats the potato mix well. I think it easiest to use your hands for this. Carefully insert the batter dipped vadas into the oil and let them fry on a medium flame till they are a nice golden brown. Turn them while they fry to ensure it cooks evenly on all sides. Don't use high heat as the outside will burn without warming the insides through. Drain off the excess oil and place on some kitchen paper to get rid of any oil on it. Serve hot with some tomato sauce. Just Another Meatless Monday @ Hey What's For Dinner Mom? Those look so good. You're so lucky to have access to those great ingredients. Oh man, these would have been great to make for Mister on Super Bowl Sunday. But then, fried food is good any day. These remind me of potato croquettes. Only spicy! I'm bookmarking this one. Thanks for sharing it with Midnight Maniac Meatless Mondays. Trisha, these are amazing! My mouth is watering just looking at those little balls of deliciousness. Thank you for your kind words about my dad - I really appreciate it. These look so yummy! Gonna have to try them. A nice change from my same old same, old recipes. Kankana, heck yeah, nothing like some hot ginger tea with it, specially when its raining outside! Oh wow, these dumplings looks delicious! :) Never thought of frying potatoes. Guess I should give these a try. Thanks Jen, I've had a lot of fun checking out the other submissions ... I'll be back and share whenever I can. Thanks for letting me be a part of it! These look so yummy!!! Definitely a recipe I can't wait to try! Thanks for linking up last week! Thanks for letting me be a part of the linky party!! !